Before we go any further, let me start by saying that for many people there is nothing wrong with gray hair. Some people consider their hair turning gray to be no more than a natural sign of aging. Many find that it suits them as they get older and it can look very attractive. Having said that, there are plenty of people that are not so happy to see their locks turning gray. This is especially the case with younger people who feel that it makes them look so much older. Why Is My Hair Turning Gray? There are numerous reasons why people’s hair turns gray. Factors like genetics, and hormonal changes are difficult to control. On the other hand, there are various environmental and lifestyle factors that might play a part such as smoking, stress and poor nutrition. Certain diseases can also contribute to premature graying of the hair including sinusitis, thyroid disorders and chronic colds. As you start getting older, individual strands of your hair start turning white or gray owing to reduced amounts of a pigment called melanin responsible for giving your hair its natural color. Melanocytes within the hair follicles are responsible for producing melanin. The higher amounts of melanin present means the darker your hair color will be. Unfortunately, as we age the activities of the melanocytes slows down and the production of melanin is decreased. Eventually melanin production stops completely, resulting in gray hair. Many people who are unhappy with this change in their appearance will turn to commercial hair color products. Unfortunately, such dyes and colors are usually laden with chemicals that can do a great deal of damage to your hair. So instead of pouring a bunch of damaging chemicals onto your hair, why not consider an alternative, healthier approach. There are many natural, herbal remedies that are both safe and often very effective in reversing graying of the hair. Before we look at some of the other common remedies, let us take a look at a Chinese herb that is causing quite a stir. 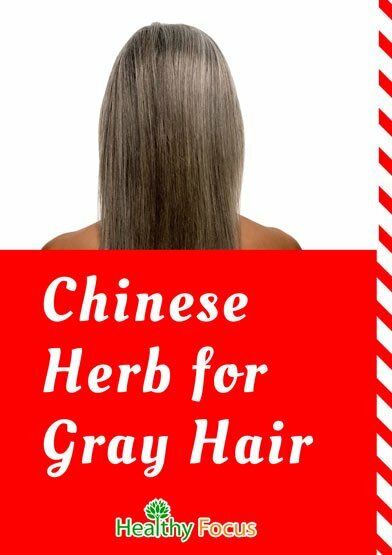 He Shou Wu which is also known as Fo-Ti or by its botanical name – Polygonum multiflorum is an extremely effective remedy for graying hair. This tuberous plant has numerous medicinal properties which are largely found in the plant’s root. The plant is a native of China but can also be found in Taiwan and Japan. It has long been used by traditional Chinese practitioners because of its excellent anti-aging benefits and its purported ability to increase longevity. He Shou Wu has an interesting name when it is translated into English. It actually means ‘Black-Haired Mr. He’ and was named after a Chinese man that regularly used the herb to help him restore his vitality and youth. According to legend, the locals who knew the man saw his hair change back from gray to its natural black color. 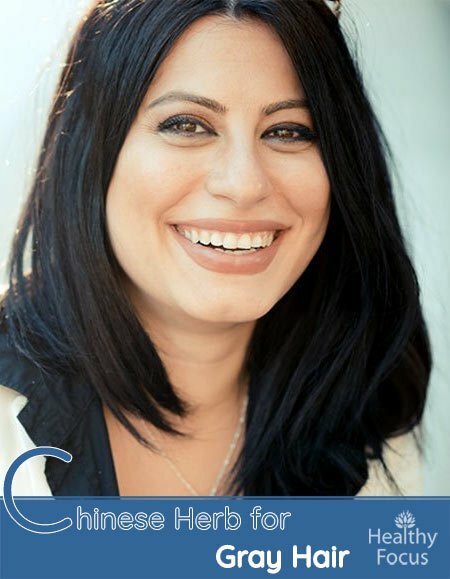 Whether or not the story is true, the herb has held onto its reputation as a safe and effective means of restoring one’s natural hair color. The body produces an enzyme called catalase which helps us break down then clear excess levels of hydrogen peroxide from the body. As catalase levels decline, so less hydrogen peroxide gets cleared resulting in a reduction in melanin production. Another antioxidant compound found in the body is an enzyme called Superoxide Dismutase or SOD. SOD helps protect the cells from DNA damage and lipid peroxidation. There is a belief that He Shou WU can help raise the levels of SOD in our body possibly because of its positive effects on the kidneys and the liver. According to Chinese practitioners, the health of your hair is a direct reflection of the health of your kidneys. They believe that weak kidneys and livers are one of the underlying reasons for premature aging including graying hair. He Shou Wu helps improve kidney and liver health bu improving red blood cell health and reducing the buildup of liver fats. According to experts, this can help stimulate the circulation of blood around the scalp and help improve the delivery of nutrients to the hair. This in turn improves the production of melanin and helps restore the color of your hair. He Shou Wu is available in several forms including capsules and tincture. For a full article about the health benefits of the herb, click on this link. Amla is a popular hair treatment that can take care of general hair health, hair loss and graying. It is very rich in antioxidants like vitamin C which have excellent anti-aging benefits. You can consume the fruit or apply the oil and pulp directly to your hair. Mix a tablespoon of amla pulp with some lemon juice and massage the mixture into your hair before going to bed. Leave it on overnight and wash out next morning. You can also combine your amla with coconut oil. Again leave on overnight before washing out in the morning. Repeat the overnight treatment several times a week and hopefully you will see some change in the color and the health of your hair. Curry leaves also have a number of benefits one of which is to increase the melanin production in the hair. When you combine them with coconut oil, they are an extremely healthy tonic for your hair. Boil up a handful or so of fresh leaves with a tablespoon or so of virgin coconut oil. Wait until the leaves are charred then strain out the oil. Massage the leaves into your hair and leave in place for an hour before rinsing. Repeat several times a week. Both rosemary and sage are great for hair health in general and may even help to retain your natural hair color. Boil half a cup of dried sage along with an equal amount of rosemary in 2 cups or so of water. Let the mixture steep for several hours before straining the herbs out. Use the liquid to rinse your hair and leave it in place for 30 minutes or so. Repeat the treatment several times each week. Henna can help strengthen your hair and give it an attractive sheen but it can also work to color your hair naturally. Take a handful of your henna leaves and then grind them into a paste. Add a teaspoon or so of powdered coffee and a few teaspoons of amla oil. Mix well and spread the mixture onto your hair. Leave it to dry then wash your hair as normal. Repeat every couple of weeks. Both coconut oil and lemon juice are full of the sort of ingredients that are great for your hair. They are full of natural antioxidants that can help strengthen and beautify your locks. When used in combination, they can be an excellent tonic that will bring your hair to life. When used over time, this mixture can help prevent your hair from graying and may even reverse the process. Mix a few tablespoons of coconut oil with an equal amount of lemon juice. Add as much as you need depending on your hair length. Massage the mixture thoroughly into your hair and scalp. Let it work for an hour or so before rinsing out. Repeat a few times each week. So, if you are looking to turn back the clock and get rid of your graying hair, there are plenty of natural options. Please let us know if any of these treatments worked for you or tell us about another remedy that you have found effective.